Kara and I really enjoy marshmellow pops. 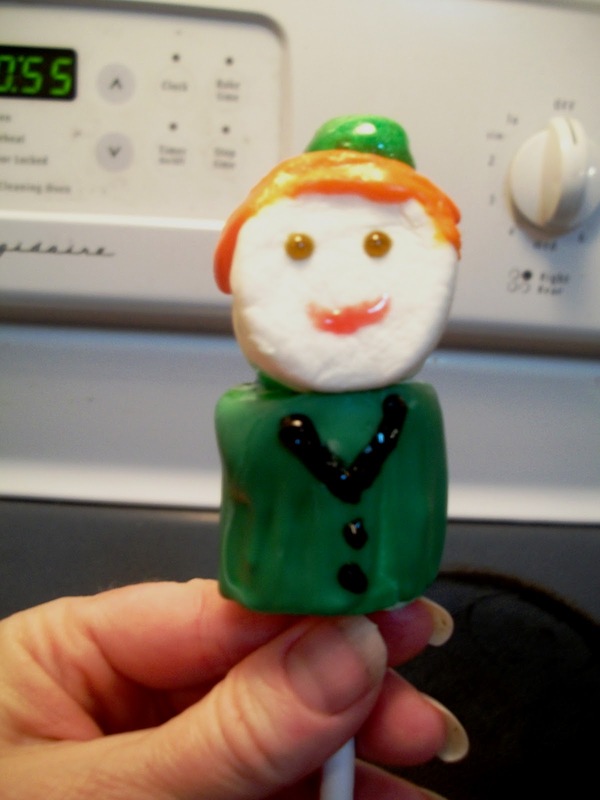 I have been looking around online for some ideas for St.Patrick's Day. I found a really cute shamrock pop, but could not find anything for leprachauns. Using only what we had on hand, we came up with this little guy. I would have been able to be more detailed with the face if I had edible markers, but all we had was cookie icing, candy melts and gels. One of the first things I did was make a base to hold my pops while I worked. It will also be used as a display once the pops are finished. 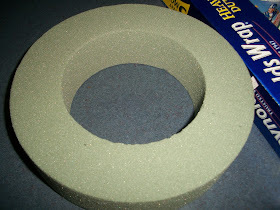 I got this foam ring from the dollar store. I covered it with foil before using it. To make the leprachaun coat, push a marshmellow on a lollipop stick, leaving enough room for another marshmellow. 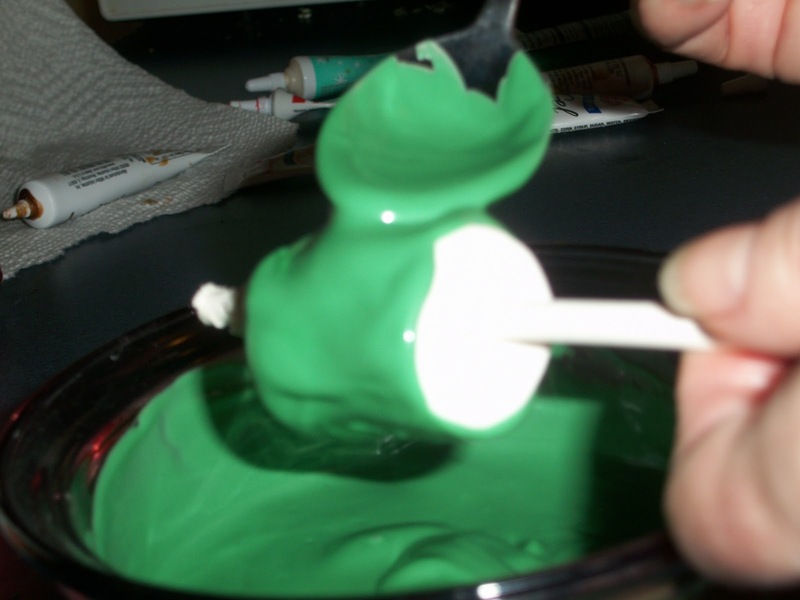 I melted some green Wilton candy melts in the microwave for 60 seconds, stirring at the 30 second mark. I used a spoon to cover the marshmellow with chocolate. 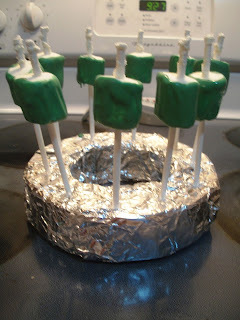 I did not dip into the chocolate because it would get green candy all over the stick. I placed the marshmellow sticks in the foam ring to allow the chocolate to harden before adding the heads. Once the candy coating was hard, I pushed on a second marshmellow onto the stick. This time I turned it on it's side to make the head. 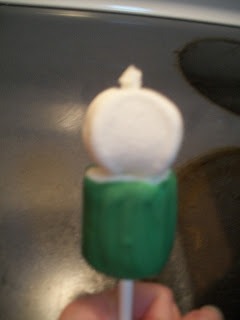 Leave just a little bit of room to add a mini marshmellow hat in a later step. 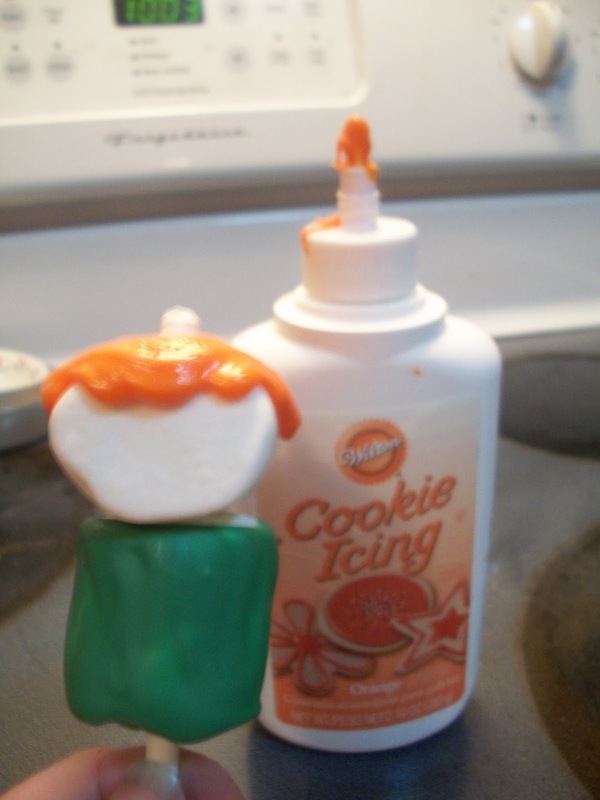 I was not sure how I was going to make the hair, but then I found a bottle of orange cookie icing. I heated it for 20 seconds at 50% power in the microwave, as the instructions said on the bottle. It had a funny tip on the bottle, so I put it on as best I could and used a toothpick to smooth it out. 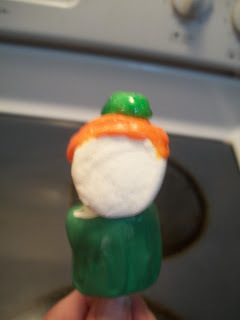 To make the hat, I added a mini marshmellow. I pushed it down slightly, to make the hat shape. I then used green gel to color the hat green. I like that the gel was nice and sparkly. I would have liked to have used edible markers for the details, but I only had gel to work with tonight. I couldnt decide if I wanted brown or black eyes so I tried it both ways. The red gel kind of makes him look clownish, but he needed a happy smile. I also added black gel the for the coat. I added a few beards on some of the pops with more of the orange icing. It was my daughters idea to add the yellow M & Ms to the display, so the leprachauns had some gold. I wish I had a better final picture. My kitchen lighting is not the best for taking pictures, especially at night. Another super easy treat idea is to use any leftover candy melts to make "lucky" pretzel rods. 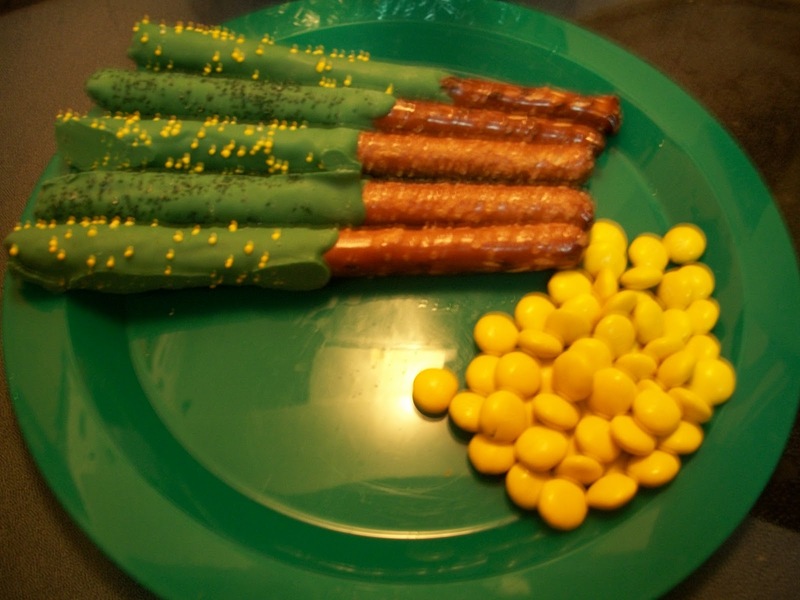 The green sprinkles are magic dust, and the yellow is gold, of course. We also put some more M & M gold on the plate. Awwww .... these are simply adorable !!! 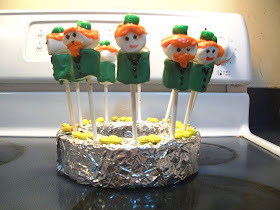 How FUN ~ those are the cutest little Leprechauns... I love 'em!